If you are one of the 178 million people in America who are missing at least one tooth, then there is a high probability that you have had—or will have—a conversation with a dentist in the Fairbanks area about dental implants. For decades, implant dentistry has been the Gold Standard when it comes to replacement teeth. 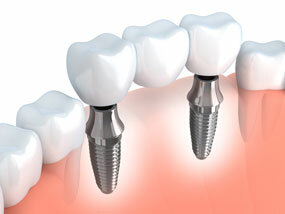 In most cases, implants are preferred by dentists and dental patients over bridges, dentures, and partials. However, the general public still tends to view dental implants as ‘new’ technology. And, we all know what happens to ‘new’ technology—it eventually gets replaced by ‘newer’ technology. With success rates that consistently hover near 98%, it isn’t uncommon to see a dental implant last for a lifetime. Once an implant has been successfully placed, they just aren’t falling out and no one is having them taken out to be replaced with something else. Implants are stronger than any other tooth replacement alternative. The only type of tooth that is stronger than an implant is a real tooth. Implants are so biocompatible that they actually stop the process of bone loss in the immediate area. This is a win-win relationship where the implant holds the bone in place and the bone holds the implant in place, too. Implants are incredibly comfortable and are designed to become a part of your body. There’s no extra effort required for you to eat, speak, and clean your teeth like normal. The future of implant dentistry is bright and promising. To ensure that your future oral health is also bright and promising, contact a Fairbanks dentist today for an implant consultation.